Channel TEN has acquired the UK family drama series, Merlin, which centres on two young men, Prince Arthur (Bradley James) and his wizard, Merlin (Colin Morgan), in Camelot. The 13 part fantasy drama premieres on BBC1 in September. 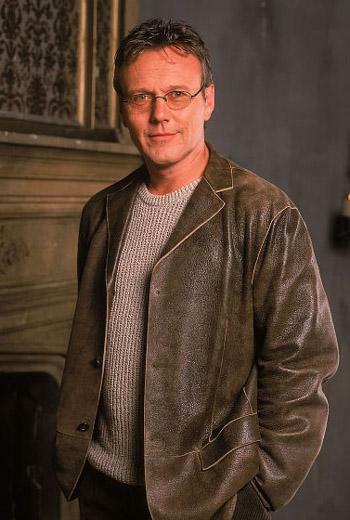 The cast also features Santiago Cabrera (Heroes) as Lancelot, Anthony Head (pictured, Buffy, Little Britain) as Uther, Richard Wilson, Angel Coulby, and Katie McGrath as Morgana (The Tudors). John Hurt will voice a CGI Dragon. Significantly the show has also been picked up for broadcast by NBC, rather than being remade by FremantleMedia’s format. Network TEN has successfully secured the much sought-after broadcast rights to MERLIN – one of the most anticipated series to come out of the United Kingdom in recent years – from FremantleMedia Enterprises. MERLIN explores the adventures of the young man destined to become the legendary sorcerer and brings to life a new legend for a contemporary audience. This action-packed, 13 x one-hour fantasy drama, reportedly one of the most significant investments by a UK broadcaster in years, revisits the saga of Prince Arthur (Bradley James) and his wizard, Merlin (Colin Morgan), in the mythical city of Camelot. The story centres on these two characters as ambitious young men, struggling to understand their destinies and road to becoming extraordinary. Beverley McGarvey, TEN’s network head of programming, said: “TEN is very proud to have acquired such a prestigious new drama. “Its multi-generational appeal, compelling cast, impeccable production, writing and special effects will make it a stand out television event and a spellbinding addition to our 2009 line-up. “It’s just a taste of what TEN has in store for the coming year. David Ellender, CEO FremantleMedia Enterprises, said: “MERLIN has the potential to draw a vast and demographically varied audience in Australia. “In this respect, we are delighted to see the show make a home on TEN which has blanket coverage of homes in Australia’s five mainland capital cities. Johnny Capps and Julian Murphy are the members of Shine Television’s Emmy Award winning production team leading MERLIN, with the spectacular CGI effects being created by The Mill, the Oscar winning visual effects team behind GLADIATOR. MERLIN’s acclaimed cast has an impressive depth of experience set to complement the up-and-coming talented leads (Colin Morgan and Bradley James) with Santiago Cabrera as Lancelot (HEROES), Anthony Head as Uther (BUFFY THE VAMPIRE SLAYER), Richard Wilson as Gauis (A PASSAGE TO INDIA), Angel Coulby as Gwen (MAGICIANS) and Katie McGrath as Morgana (THE TUDORS). Legendary actor John Hurt will be lending his iconic voice as the great Dragon. MERLIN is a Shine production for the BBC, and will premiere on BBC One in prime time this September. In addition to Australia, FremantleMedia Enterprises has also closed pre-sales over the summer, prior to its launch at MIPCOM, with leading broadcaster NBC in the U.S. (who will air it in Winter 2009), and CTV in Canada. FremantleMedia Enterprises is the exclusive international rights holders for distribution, licensing, and home entertainment (excluding the U.K.).